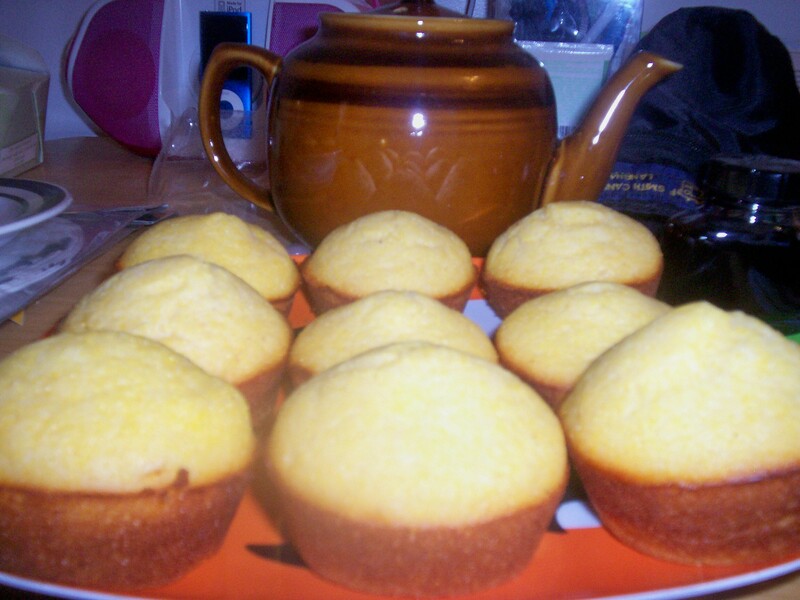 I made muffins, Cornbread muffins. They lasted a few days and were great for taking to work for a midnight snack. Really easy to make. I might make more soon. The recipe came off the back of a bag of cornmeal, and was just yumtastic. 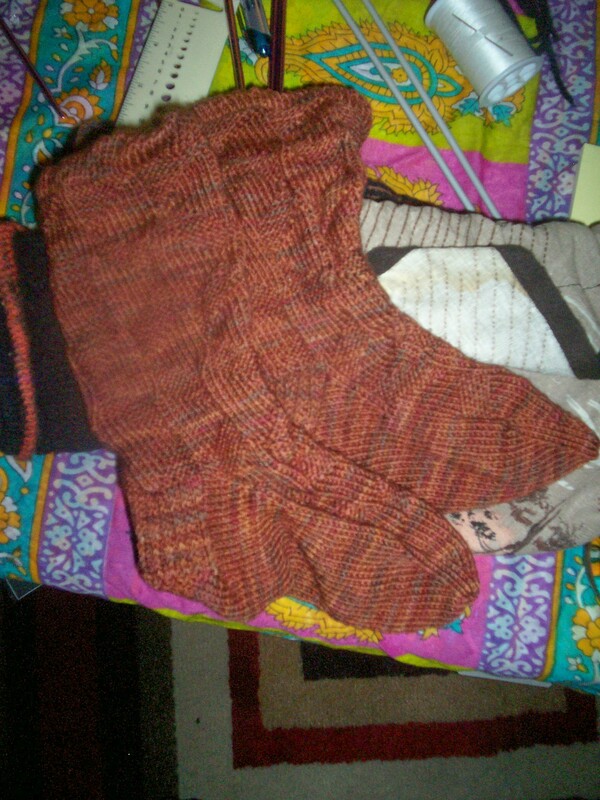 Stacy’s socks are finished (this is pre-blocking). They were quick and look great in the colorway. I’m sure she’ll like them. 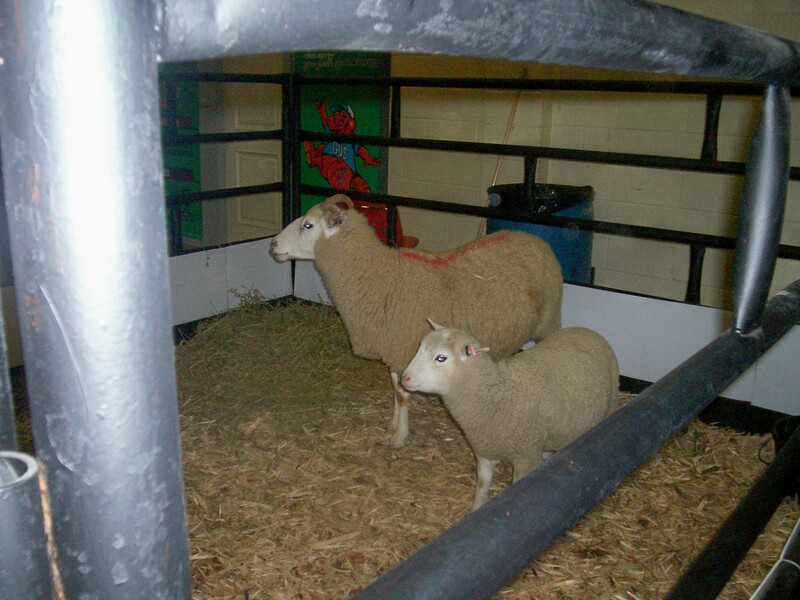 Wednsday I went to the Western Canadian Agribition and met these two, a mamma and her baby. They were very skittish but so pretty. Of course I talked to them and my mother thought me insane. I have also finished part of project X and all of Project Y (neither of which will be pictured here as mom reads the blog). I finished Josephine’s sweater and started Immy’s. My christmas knitting is really comeing along, it’s strange to think I will not be down to the wire this year, probably because I’m not trying to knit as much as I have in previous years. So the spare room isn’t seeing much improvement I admit, it is going to get some shelves though and I think that will help. The shelves will probably be above where the loom is. You can also see the veritable cornucopia of nightmare before christmas stuff and my nagging obsession with all things sheepy. 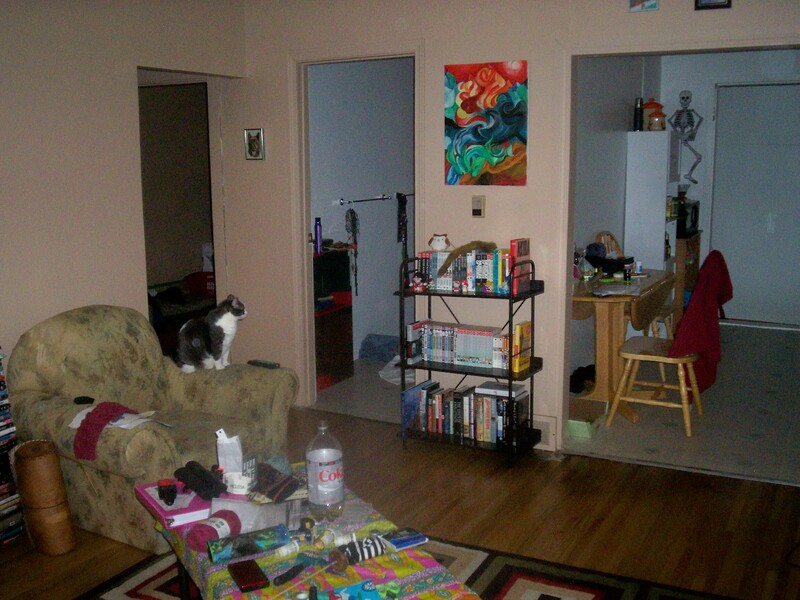 The living room on the other hand is coming together nicely (see bebop being all chill on the couch). I have come to the conclusion that there needs to be more rugs, I forgot that about hardwood, it’s beautiful and healthier for you but man it’s cold and slippery. 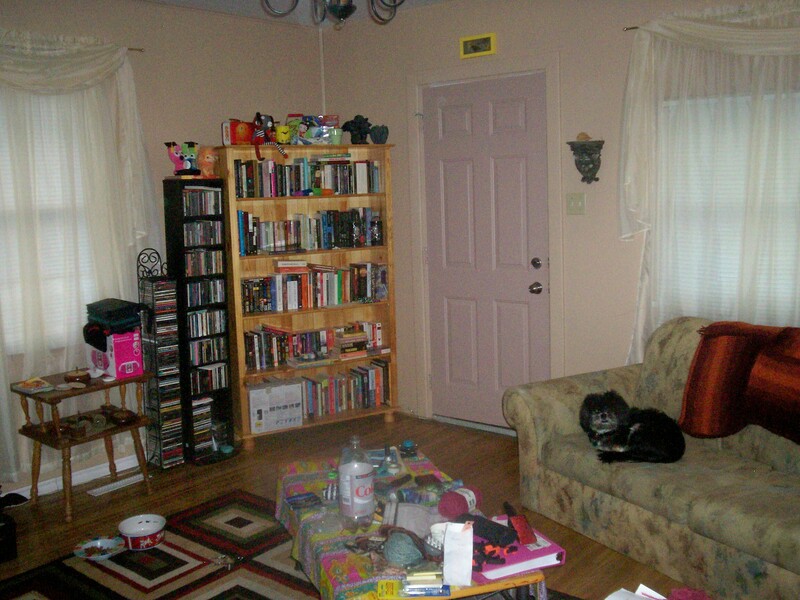 I took this picture standing infront of the door/bookshelf. Isn’t Frankie majestic? The cats all have their prefered spots now with my new pillow being the cream of the crop spot. 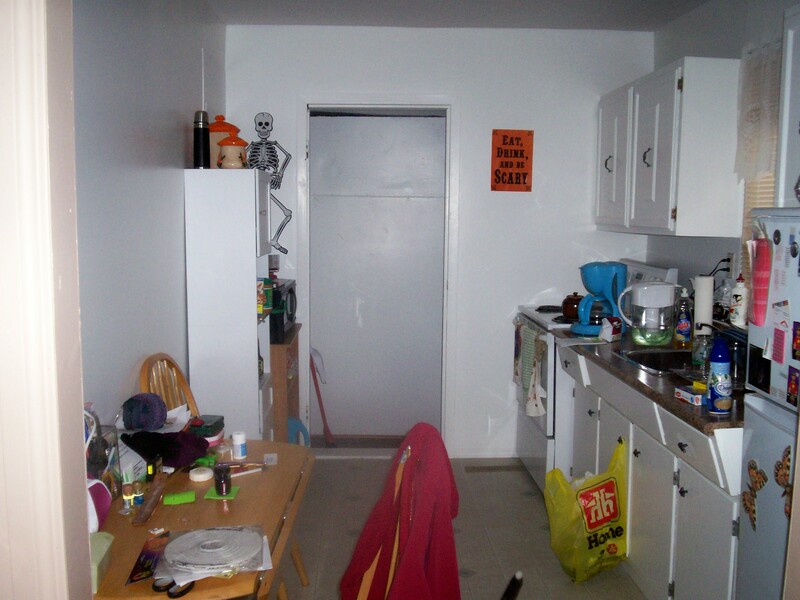 The kitchen, still messy (I wonder if I will ever have a clean table). It’s a storage nightmare but we’re thinking of getting a wire microwave stand in place of the one that is currently there. That would give me three more shelves for storage and that would be nice. 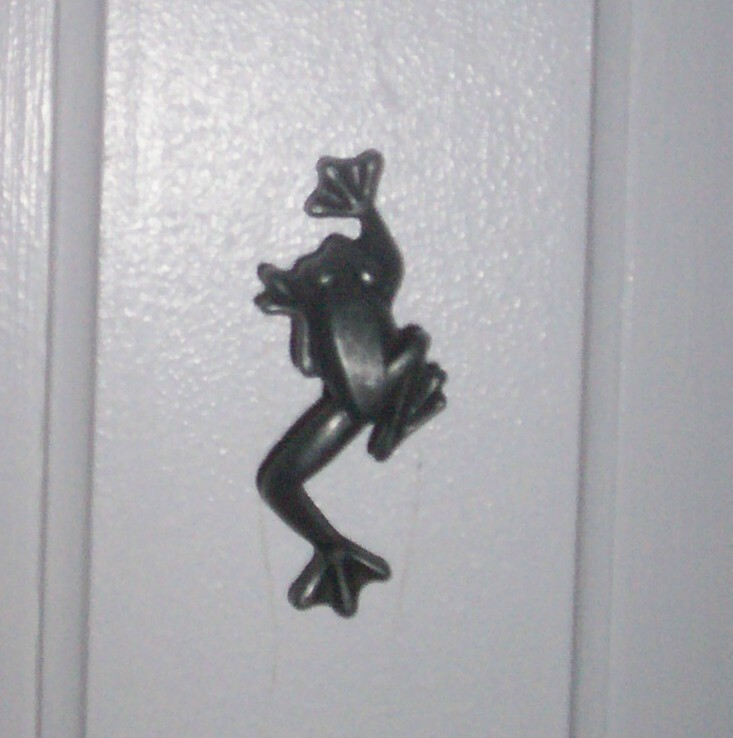 My new nobs for the kitchen are frogs, I couldn’t resist taking a picture of them. I went to a place that a friend at my former work had told me about and found these, whats better is that they were super cheap I got the whole 12 nobs for 25 dollars. 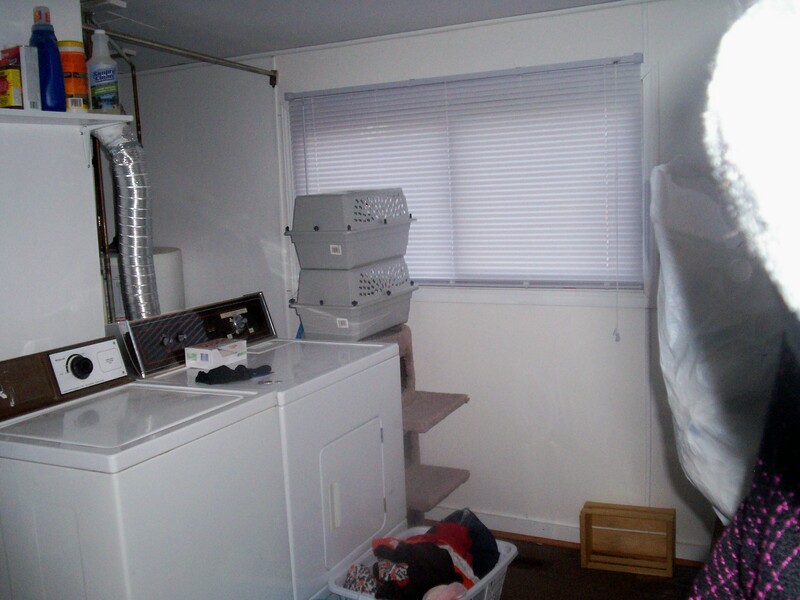 I’ll save you a view of the cat litters but here’s my back landing laundry, you can kind of see where the furnace and water heater are (with the lovely makeshift keep the cats out tower). That sums up my new house at the moment. I’m still working away. Tonight, cooking, tomorrow Knit club night. So I started in on Josephine’s Christmas gift, a sweater (all three neices are getting a sweater, Zibbie’s is done and now I’m onto Josephine’s). Yarn: Marcella by Eaton’s (I found it at Value Village there was a whole bag of it and I immediately thought of christmas gifts for the neiclings). Since I already made one the pattern is even easier this time around, but the pattern is easy to begin with. I’m not sure if it’s that it’s a simple pattern or that it’s a well written pattern because it is very well written and easy to understand. In accordance with the knitting gods I was bitten by the Daybreak bug, although with all the christmas knitting I don’t really forsee this being finished until the new year. Still I cast on with wanton abandon and did some mindless knitting at work. My big thrill this week was finishing the second pair of Norweigan snail mittens. I was knitting them for Roxanne, and she’s coming into town at the end of the month, I wanted to have them finished so she could be warm this winter. I really plowed through them at work (the second mitten took about three days). I had to put my christmas knitting on hold to get these done, as she asked for the pair a long time ago (before it was even remotely cold) I felt that I really should get them done. The great thing about Roxanne is that she’s one of those people who knows what quality is, and she knows how much effort goes into knitting. I know that the mittens will be enjoyed and loved. Dispite my dislike of knitting thumbs and the struggle I almost always enevitably have with welts, I know it will be appreciated and used which makes it easier to do. Now I should go get ready, there’s a craft show today, and I also have to take the dog to the vet for his yearly shots (poor muppet). One of the things about my new job is there are a few hours (those wee hours in the morning) where I can sit and knit. I enjoy this aspect the most of all (cause let’s face it, 12 hour shifts are intense without a little knit release). Last night I almost got the first sock of my SIL’s christmas pair done. Pattern: Cauchy in Sock Innovation by Cookie A.
I wanted something with a bit of challenge but not so challenging that I wouldn’t be able to get the other christmas knitting done (so far I’ve got one of the three childrens jackets plus this done). If I keep being able to knit for a few hours every night I may very well make my goal. Now I have knit the Norwegian Snail mittens before, for myself, but a friend of my mom really wanted a pair so I got the yarn together a while back and started. They languished in the WIP pile for a while while I was moving but they’ve been dug out again. I want to have them finished in time for her to use them this winter. The first one is done (sans thumb as I’m doing those last). The second one is started and I’m on the second of three welts. Well that’s what I’ve managed to get done while moving and new job takes over my life. I bet you were expecting yarn? Well that’s coming. The move happened, I got a new job (which I was being very quiet about), and I lived through the end of October. So I started unpacking yesterday when everything was moved in. The first thing I unpacked was the yarn, movies, music, and books. According to Alisha I zen-ed out shortly after I had started unpacking them. Intermitant antibiotics and advil made this whole move possible, but there was no way around it, it was happening if I was with it or not. Comic books and manga, DVD’s, pet treats, and the big lebowski bobblehead also got unpacked. 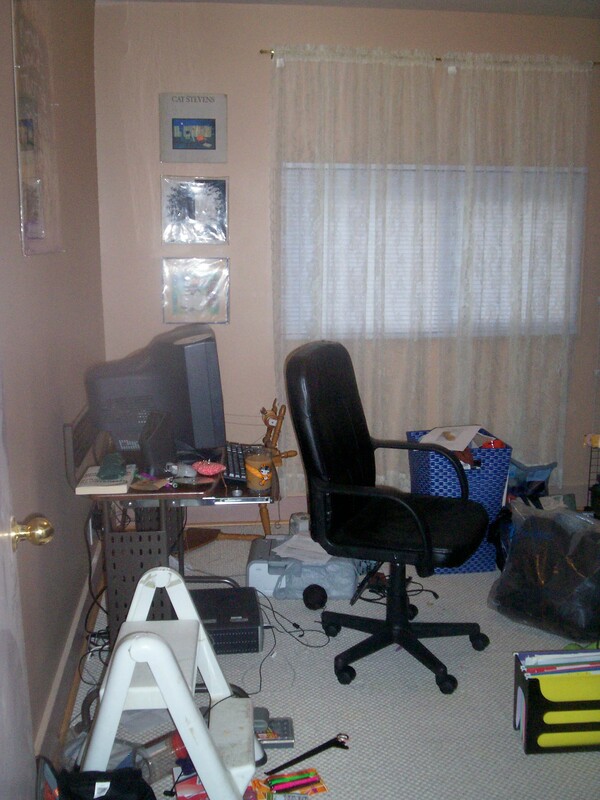 I don’t know how I managed all this stuff in an apartment. I know once it’s all put away it’ll be better. Of course when I get to stressed out I come into my spare room (the office/yarn room) and I stare at the yarn. 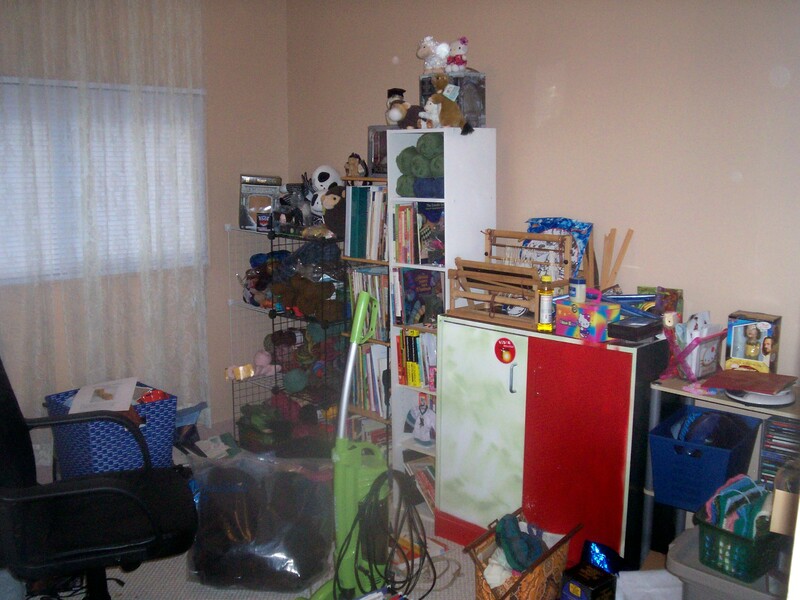 Because I’m not allowed to start a new project until I am at least done unpacking.